Just like Moses, to whom he was compared, Camille Pissarro may have “led his colleagues to the promised land” only to be denied entry himself. Yet for three-quarters of the 20th century his work was the least known of the major artists of the group. A rediscovery of the artist and revival of his status began around 1980, via several major international exhibitions and publications. First his epochal landscapes, then his magnificent cityscapes painted late in his life. And now his figure paintings. His abilities were liberated and energized by the new freedom for artistic expression – and to engage fearlessly with the wider European culture – pent up so long in the intense but confined lives of European Jews. A freedom extant only a generation or two in some countries, and not yet attained in others. 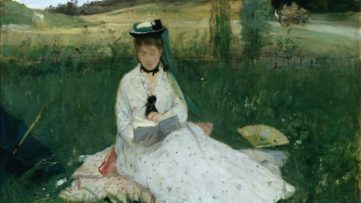 Proof of this emancipation may be seen in his paintings, which no one has found to look “Jewish”: they are exquisitely French Impressionist and firmly grounded in the long European tradition. On the other hand, one gets a strong feeling, when studying his life and his work, that the Jewish life of the mind, both intellectual and emotional, makes a strong contribution to European art and thought through him. His probity and seriousness likely came from the same ethnic heritage. Camille Pissarro born in 1830 in St. Thomas, in the Caribbean, to a Sephardi Jewish mercantile family that had recently moved there from Bordeaux. [The] Marranos moved to Bordeaux during the 1700s, where they were able to return openly to Judaism. Ironically, despite the freedom for the Jews, his parents’ marriage was not approved by their synagogue in St. Thomas. This of course caused the family a great deal of pain and helped inspire Camille’s resolutely secular Jewishness. His parents sent him to Paris for French schooling from age 11 to 17. 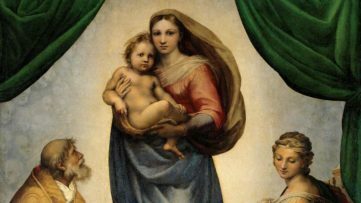 He returned to St. Thomas and the family business, but spurned that life as too bourgeois and went off to Venezuela to paint. Enticed back to St. Thomas briefly, he left for Paris for good in 1855. His parents soon followed. He died in Paris in 1903 after a long, fascinating life and career marked by artistic acclaim, dedication to his family, love for his fellow man and financial struggle. Pissarro never spurned his family, only their lifestyle. He remained close to them, especially to his mother, overbearing though she was. He maintained his connections to Jewish life – to Jewish people but not to the synagogue. He married someone his cultural opposite, a Catholic woman from a rural setting who was one of his mother’s servants. Of course his mother did not approve. Not only did he not dissemble his Jewishness, judging by how he looked he relished it. With his long flowing beard – which whitened early – his large aquiline nose, full, prominent eyebrows, his reputedly biblical mien and a way of dressing that was decidedly not highsociety, he was likened to biblical prophets, to Moses, and le bon Dieu (the good Lord). His wise and dependable personality and almost rabbinical role among the artists contributed to this. Whether it was because he was infallible, infinitely kind and just – or was it his prominent beaky nose and long white beard? – in any case, everyone who knew him in the Nineties thought of him as something like God the Father. Virtually every advanced painter of his era was artistically indebted to him. 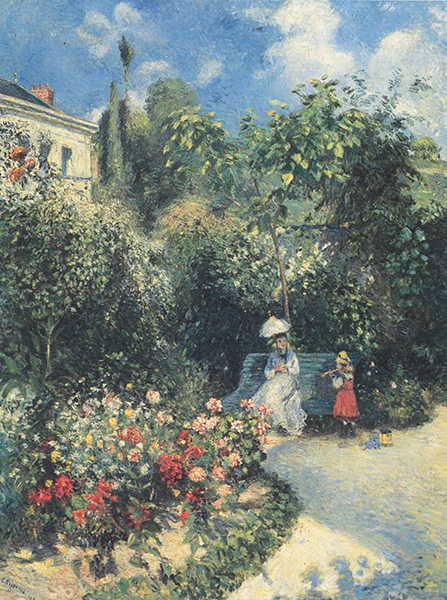 In 1868-70 he, Renoir and Monet worked “as if roped together like mountaineers,” Pissarro remarked. Vincent van Gogh learned about color from him and called him “father to us all.” Pissarro’s protégé Gauguin, not usually one for gratitude, said, “everyone paid attention to him… he was one of my masters.” Cezanne, owing him deeply, artistically and psychologically, maintained, “we are all derived from Pissarro.” Matisse was moved to tears just in meeting him and later visited him repeatedly. The originality here is profoundly human… Never before have paintings appeared to me to possess such an overwhelming dignity…. Camille Pissarro is one of the three or four true painters of this day. In 1873 the critic Theodore Duret told him, You’ll be going along a new road, as far and as high as any master,” but Pissarro was already well along that road, much of which he had paved himself. “…M. Pissarro, who is basically the inventor of this painting…” wrote Armand Silvestre of the first Impressionist exhibition in 1874. Pissarro was understood then as the inventor of modern art, along with Manet, and of incipient abstract art. Pissarro’s contemporaries may have considered him the greatest of them all. Writers in our own day have begun to recognize the truth in this. His work revealed many sources of abstraction. The figure paintings in the current exhibition create it via contour – the strong boundary for the inventive shapes of the figures – even while they are equipoised in his snowstorm of brushstrokes. This interplay helps set up the sensitive figure-ground equilibrium so basic to abstraction and to firm composition. A fresh quality of composition in these paintings unexpectedly connects Pissarro to cinema. The pioneering photographer Nadar was part of these artists’ social scene and the first Impressionist exhibition was held in his studio. Protocinematographic studies of figures in motion were newsworthy and Pissarro would have seen them. Sequences of figures in some Pissarro paintings seem informed by these studies. And this reminds us of something else almost cinematographic about the lack of stillness in all his painting after 1868, capturing more than one moment in time, a palimpsest of many moments. The endless development in a Pissarro painting (and throughout his career) always repays closer attention – in fact, requires it. Curator Richard Brettell makes deeply interesting observations. But his commentary ultimately succumbs to caricature, limiting the artist’s work to an expression of anarchism. This is not the first time a writer has hijacked Pissarro for political fantasy. 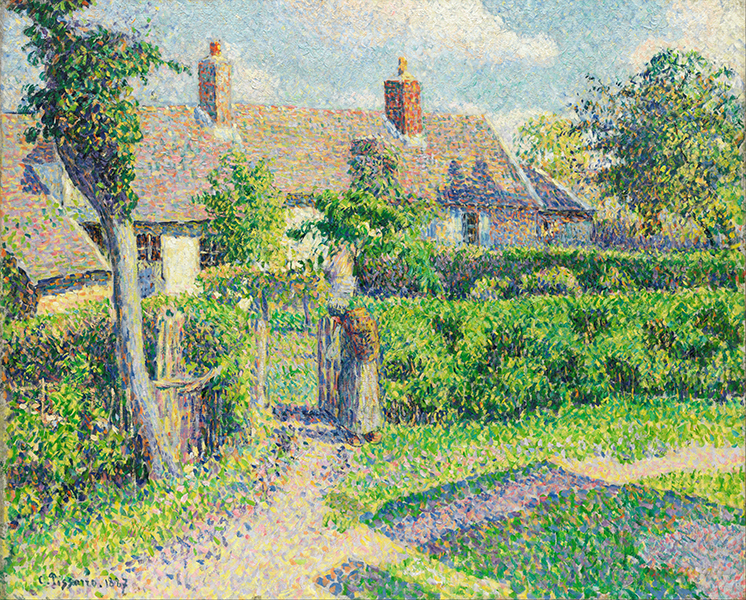 True, Pissarro followed anarchism seriously – and his work showed great empathy for his fellow man (in these paintings the farming folk he lived near) – and just as much for his large nuclear family and their personal milieu, the wider world of artists’ concerns and the life of painting itself. Visual art is far more comprehensive than the political approach to it allows. Pissarro himself railed against any sort of sentimentality in art, political or otherwise; he called it “corrupt.” But sentiment, honest emotion, his work has aplenty, expressed through its great integrity of form. Not political fantasy is the anti-Semitism any Jew in Europe had to reckon with, though it did not characterize the avant-garde’s relationship to Pissarro. Most French artists and much of French society at large easily accepted Pissarro as one among them, not just as a Jew. He was loved by many and to some his being a Jew was a good thing. Intruder! What made Pissarro, the consummate insider of the art scene, feel like the outsider to his own milieu? 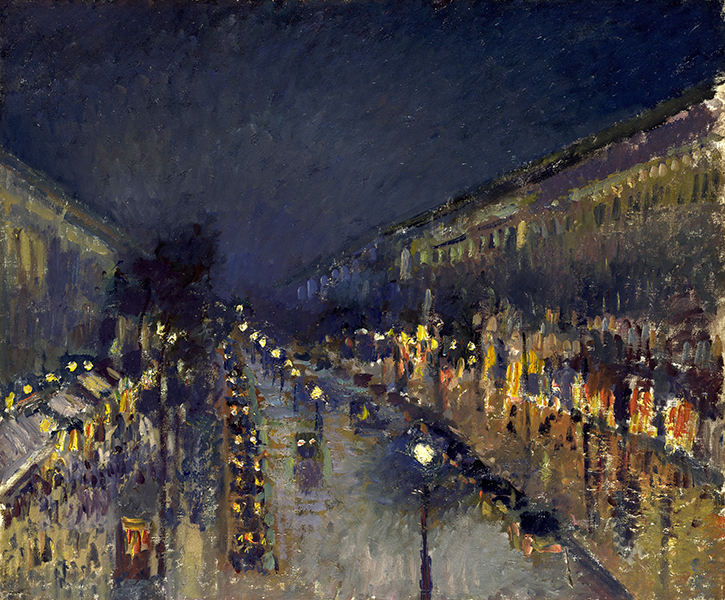 Such an atmosphere certainly inhibited Pissarro’s success and influence. Starting in the mid-1890s France was convulsed in a tidal wave of anti-Semitism, including violent street riots, catalyzed by the Dreyfus Affair. Captain Alfred Dreyfus, a Jewish officer in the French army, was unjustly convicted of treason – giving secrets to the Germans – publicly humiliated by the army and sent into solitary confinement in the dreaded prison on Devil’s Island. Then evidence came out that Dreyfus had been framed. The French army and its rabidly anti-Semitic allies in the French press were on one side, adamant and courageous supporters of Dreyfus (many of them gentiles) on the other. The hatred divided and infected the country deeply and did not fall much into the background until World War I, only to reemerge in the 1930s. During the same period as the Dreyfus Affair, Paul Cezanne’s apotheosis and substantive influence took over modern art. Cezanne, his artistic achievement, and his quirky personality may have been the more acceptable enthusiasm; Cezanne’s work was a revelation because it was was great and hadn’t been seen much. Perhaps, also, some people in the French art world preferred that its hero not be a Jew. Others may have demurred at buying the art of a Jew. Such things add up. It’s not so far-fetched – Renoir, Degas and Cezanne took the side of the anti-Dreyfusards and turned their backs on Jews and on Pissarro. They couldn’t have been the only ones. We know something of Pissarro’s harrowing experience of the anti-Semitism of the Dreyfus period, as well as his characteristic perseverance through it. But little has been ventured about its effect on his reputation and posthumous career. 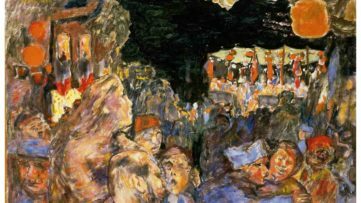 Did a culture-wide upheaval of anti-Semitism suppress the importance of the one Jewish artist among the greats of the era? His role was virtually eradicated and he all but disappeared from the map of art history for most of the 20th century. Or is it only that tastes change, and the paths of 20th-century art, and art history, have been fickle? After the Dreyfus Affair and until the late 20th century, Pissarro was mainly regarded as a good landscape painter and a helpful friend to artists. How much was it owing to anti-Semitism that Pissarro was essentially left out of the canonical development of modern art, though he was one of its main progenitors? Was he the Moses of modernism who led his colleagues to the promised land, but was not allowed in? 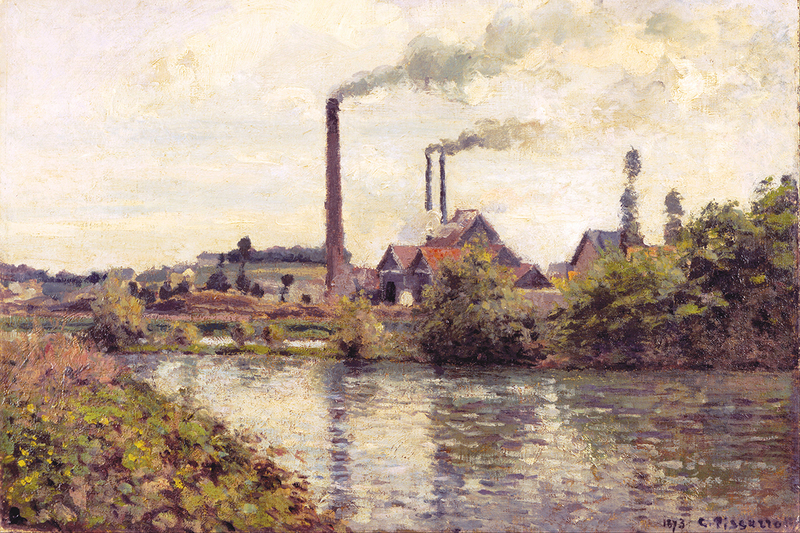 Featured image: Camille Pissarro – The Factory at Pontoise, 1873. Oil on canvas, 380 mm (14.96 in) x 550 mm (21.65 in). Israel Museum Jerusalem. All images via Wikimedia Commons.